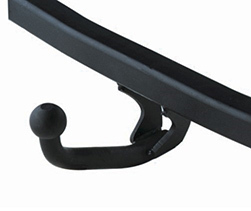 We supply and fit a complete range of towbars, including fixed flange, swan neck and detachable bars. All work is professionally undertaken at a place that is best for you, i.e. at home or work. We use soldered joints on the electrics where possible. Services include replacement and installation for all makes of vehicles. All leading manufacturers fitted: Witter / Westfalia, etc. Lifetime warranty on all towbars and electrical installation given. A choice of towing couplings and accessories can be fitted. The towball is removed when not in use preserving 'shins'. AL-KO towballs can be fitted. Won't trigger reversing sensors when not towing. Towball is removed when not in use preserving 'shins'. Unrestricted access to the boot. AL-KO and other friction type stabilisers can be fitted. Less likely to trigger reversing sensors. Slightly more expensive than the flange towbar. Cannot be fitted with a bumper shield.